Harvest Supper, Friends of the Museum annual fundraiser. Set on the grounds of Rowan Oak, the event benefits University of Mississippi Museum and Historic Houses. The Friends of the Museum is a volunteer organization that supports museum fundraising, advocacy and special programing. Harvest Supper, hosted by the Friends, prides itself on being a showcase of local and regional artists, musicians, and chefs. 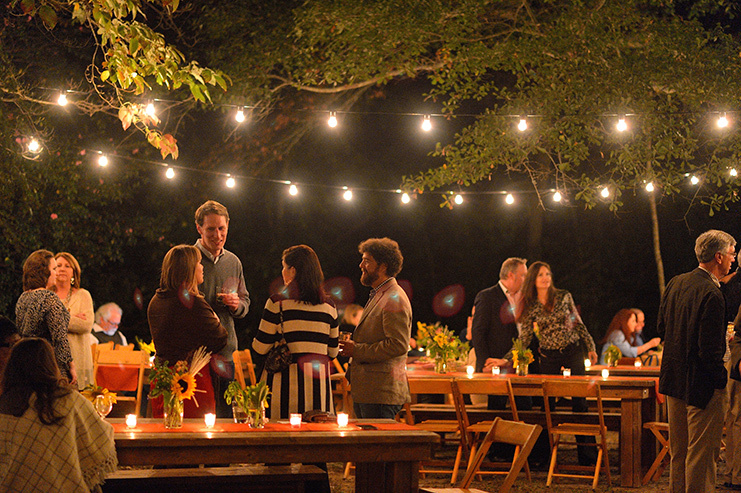 Annually, the event connects alumni, local residents, and out-of-town guests with artists, writers, and musicians for dinner and entertainment on the historic grounds of Rowan Oak, the former home of Nobel Prize-winning author William Faulkner, in Oxford, Mississippi. The generosity of sponsors, ticket sales, and art auction proceeds enable the Friends to target specific museum needs to enrich the overall museum experience. Repeatedly named as one of the top college museums in the nation, the UM Museum hosts visitors from all 50 states, as well as 58 countries. In addition, the museum’s educational programming reaches more than 10,000 North Mississippi students and children each year. Through Harvest Supper, the Friends has been able to give more than $100,000 annually to the museum, most of which comes from sponsorships. To learn more about Harvest Supper sponsorship opportunities, click here. Harvest Supper 2019 will be Thursday, October 17 at 6:30 p.m.
Click Here for 2019 event information. Interested in past Harvest Suppers? See below. The various sponsorship levels guarantee tickets to the Harvest Supper, admission passes to Rowan Oak, membership to the University Museum, and much more. For information on becoming a sponsor for the 2019 Harvest Supper, please email the museum. Proceeds from the evening will help support numerous aspects of the University Museum, including acquisitions, the Conversations guest lecture series, exhibitions, educational programming, and special events. The event also supports maintenance and operating costs for Rowan Oak and the Walton-Young Historic House, also managed by the museum.